Cat#: AA-105/106 Year: 2014 Price: $6. Boston-based Erik Lindgren is best-known for his crossover chamber/new music instrumental quartet Birdsongs of the Mesozoic, owner of the Arf Arf label specializing in quality reissues of ’60s Garage/Psychedelic rock and Outsider music, plus the force behind his avant-garde studio moniker Space Negros. 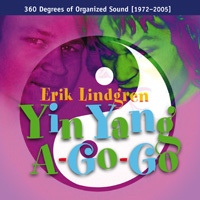 Yin Yang A-Go-Go [1972–2005] presents a glimpse into his diverse (if not certifiably psychotic) career as a prolific composer and producer. Here, Lindgren has hand-picked 50 genre-smashing personal highlights culled from his work with Birdsongs, jingles, Musique Concrete, New/No Wave, contemporary Classical compositions, corporate video soundtracks, Garage/Psychedelic/Punk/Power Pop, Space Negros, Techno and more. Be prepared for a whirlwind audio ride of eclecticism-to-the-max that is not for the faint of heart! This budget-priced 2-CD sampler is an excellent way to get familiar with Lindgren’s unique musical vision spanning 360 Degrees of extreme musical aesthetics. YYAGG comes with an informative 16-page booklet packed with photos, liner notes, and references his three-dozen solo, ensemble, and commerce-driven CD releases.